Most individuals with chronic tinnitus have high-frequency hearing loss, induced by noise exposure, otological disease, or the aging process. Physiological evidence suggests that in such individuals, tinnitus is likely caused not by irritative processes that persist in the ear after cochlear injury, but by changes that occur in central auditory pathways when the ear is partly disconnected from the brain. In animals, hearing loss induced by experimental noise trauma leads to a reorganization of tonotopic maps in the primary auditory cortex, such that frequencies near the edge of normal hearing come to be overrepresented at the expense of frequencies in the hearing loss region. Neurons show increased spontaneous firing rates in cortical and subcortical auditory structures, and in the auditory cortex, increased synchronous activity in the region of hearing impairment. Evidence from physiological, psychoacoustic, and human brain imaging studies suggests that increased neural synchrony (temporally coupled neural activity) in the hearing loss region may be an important mechanism contributing to tinnitus. Tinnitus spectra and residual inhibition functions overlap the region of auditory threshold shift, consistent with this hypothesis. Several forms of neural plasticity may contribute to changes in spontaneous firing rates and neural synchrony that develop after hearing loss. Because the tuning of auditory neurons can be modified by acoustic training procedures throughout the lifespan, it may be possible to reverse some of the neural changes underlying tinnitus. For this goal to be achieved, it must be possible to modify auditory representations by acoustic training in individuals with tinnitus, and the neural modifications induced by training must intersect with the underlying tinnitus mechanisms. 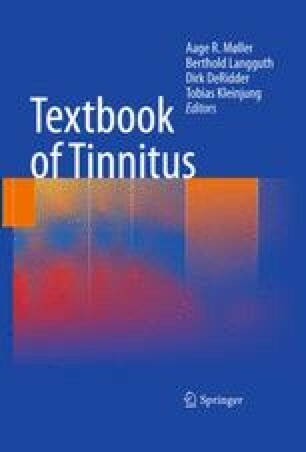 Auditory plasticity in normal hearing individuals and people with tinnitus requires further study. The research of the author reported herein was supported by grants from the Canadian Institutes for Health Research, the Natural Sciences and Engineering Research Council of Canada, the American Tinnitus Association, and the Tinnitus Research Initiative. I thank my colleague Daniel Bosnyak for his role and Phillip Gander, Victoria Mosher, Graeme Moffat, and David Thompson for their contributions.